We found gravitational waves. But where does physics go from here? Early this year, the LIGO Scientific Collaboration announced a major breakthrough in scientific research: Gravitational waves are real—we finally found them. Gravitational waves were a major part of Albert Einstein’s theory of relativity, which he outlined about a hundred years ago. This discovery was the last missing piece in Einstein’s theory, a theory which asserts that space and time are intrinsically linked—interwoven and dynamic—and able to stretch or shrink. In the excitement that came after proving the existence of gravitational waves, an important question may have been overlooked: Where are the waves coming from? We knew about where, but the specifics were kind of hazy…and we don’t know where they will come from next. Now, a group of researchers led by a University of Notre Dame astronomer Peter Garnavich are studying the origins of gravitational waves. 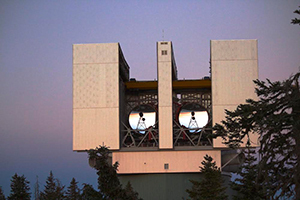 To do this, the group is using the LBT (Large Binocular Telescope), located in southeastern Arizona. Using this, the team hopes to find light emissions from the event that generates gravitational waves. The researchers realize they have their work cut out for them. Garnavich compares their efforts to finding a needle in a haystack, given that the section of space that LIGO has identified as a possible location contains millions of stars and galaxies. “We hunt for things that snap, crackle or pop in their light output, and that narrows candidates down to maybe 100 across the sky,” he said. LBT will be used to continue identifying promising areas of study. The continuation of this research will ultimately give deeper and better insight into how our universe really works.